MVP Justin Doellman paced the winners with 16 points. 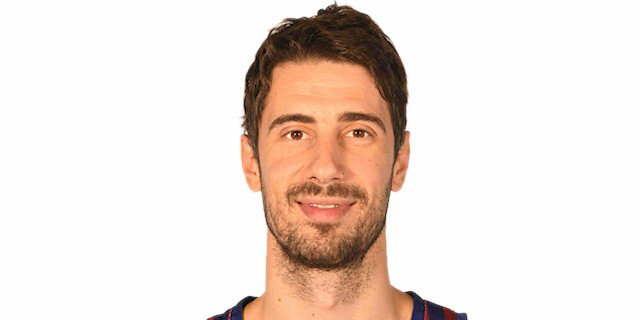 Brad Oleson and two-time All-Euroleague center Ante Tomic each added 15 while former Turkish Airlines Euroleague MVP Juan Carlos Navarro had 12 and 8 assists for Barcelona. Nihad Djedovic led Bayern with 19 points against his former team. John Bryant added 16 and 11 rebounds, Lucca Staiger had 12 points while Dusko Savanovic and Heiko Schaffartzik each got 10 for the guests. A three-pointer by Oleson gave Barcelona an early 15-9 lead. Schaffartzik and Vasilije Micic allowed Bayern to get a 17-19 edge late in the first quarter. Savanovic followed a triple with a layup for a 25-28 Bayern lead. 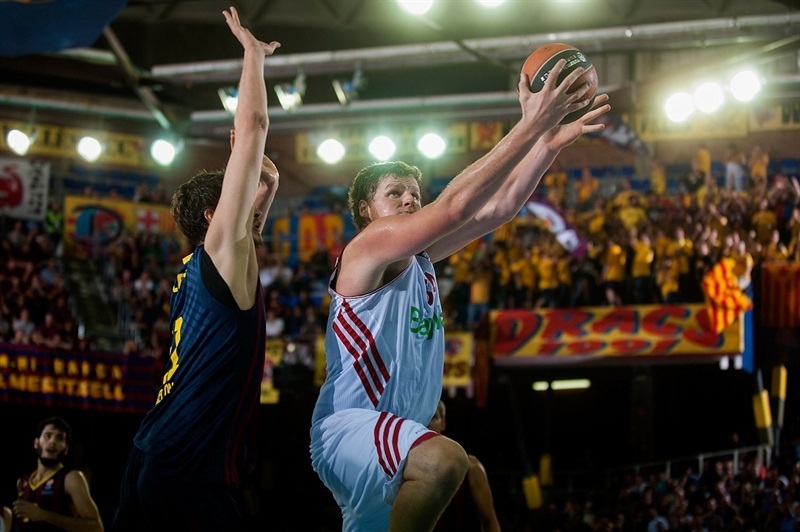 Three-pointers by Navarro, Bostjan Nachbar and Doellman gave Barcelona a 42-36 lead but Djedovic singlehandedly brought Bayern within 44-43 at halftime. Bryant struck from downtown and Djedovic added free throws to give Bayern its biggest lead, 54-59. 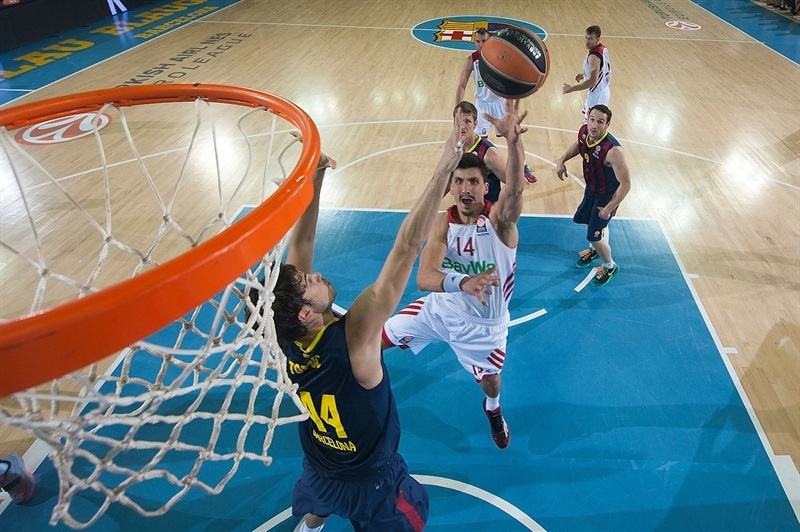 Navarro, Oleson and Tomic fueled a 12-0 run which allowed Barcelona to get the lead for good, 68-59. Bryant and Djedovic managed to bring Bayern as close as 73-71 but back-to-back three-pointers by Oleson and Marcelinho Huertas allowed Barcelona to seal the outcome down the stretch. Tomic got Barcelona going with a layup and a block on Djedovic. Anton Gavel sank jumper but DeShaun Thomas scored in transition for a 4-2 Barcelona lead. Djedovic shined with a three-point play, Tomic split free throws and a layup by Bryant gave Bayern a 5-7 edge. 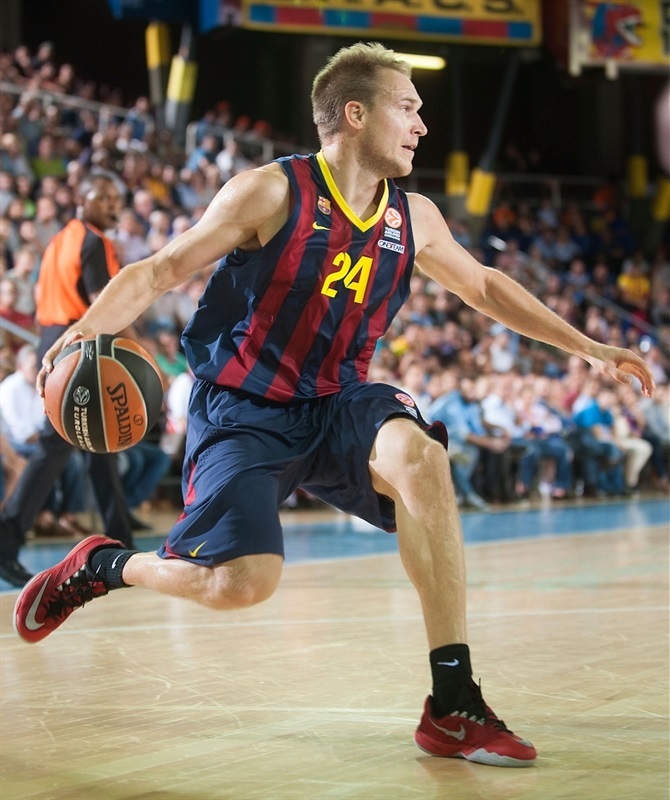 Doellman answered from downtown and Tomic added a five-meter jumper, as Barcelona kept powering the boards with great aggresiveness. Savanovic scored off a steal but Thomas fed Thomas for a layup and Oleson struck from downtown for a 15-9 Barcelona margin. Schaffartzik nailed one from beyond the arc, as Bayern tried to slow down the game tempo with Micic and him together on court. Bryant and Doellman traded baskets and Staiger joined the three-point shootout to tie it at 17-17. Micic took over with a reverse layup and free throws by Alex Abrines fixed the score at 19-19 after 10 minutes. second quarter: a rain of three-pointers! Schaffartzik shined with a turnaround jumper early in the second quarter which Nachbar erased with a dunk. Navarro dished his fifth assist to Abrines for a backdoor layup, good for a 23-21 Barcelona edge. Nachbar and Robin Benzing exchanged free throws and a three-pointer by Savanovic made Bayern regain the lead, 25-26. Savanovic kept pacing Bayern with a close jumper, Abrines split free throws and a big triple by Navarro provided another lead change, 29-28. Bryant joined the three-point shootout with one in transition but Navarro followed an acrobatic layup with another bomb from downtown to make Bayern call timeout at 34-31. Nachbar and Staiger exchanged three-pointers and a layup by Savanovic kept Bayern within 37-36. Oleson scored around the basket and Doellman did it from beyond the arc for a 42-36 Barcelona lead. Djedovic answered from downtown, traded baskets with Tibor Pleiss and beat the buzzer with a layup to get Bayern as close as 44-43 at halftime. Staiger nailed a long three-pointer right after the break, as Barcelona struggled to get Tomic involved down low. Bryant fed Gavel for a layup which Nachbar matched with a rainbow jumper in the paint. 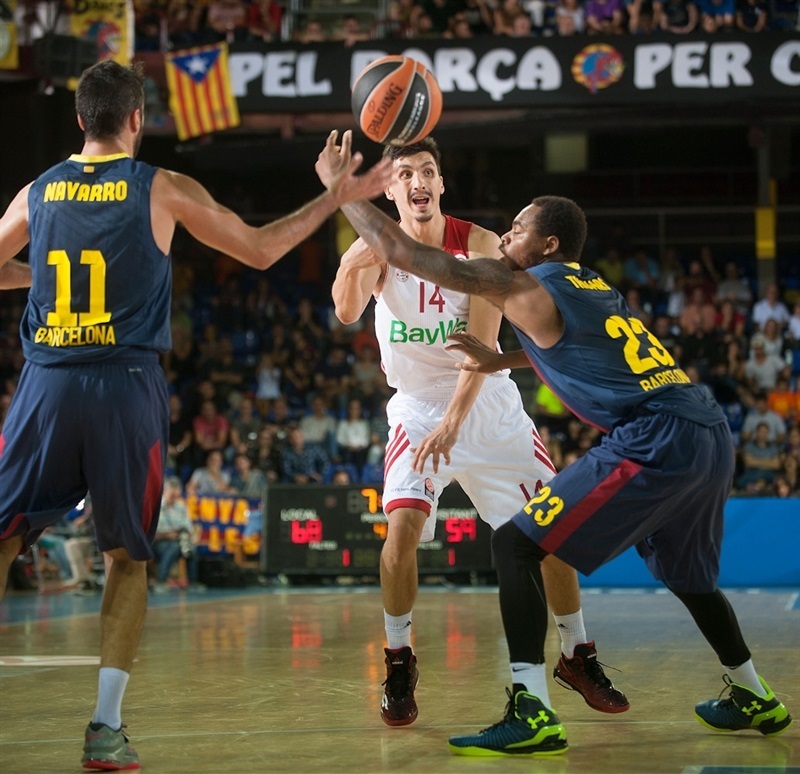 Djedovic shined with a floating layup and a free throw by Bryant made all Barcelona start to wonder at 46-51. 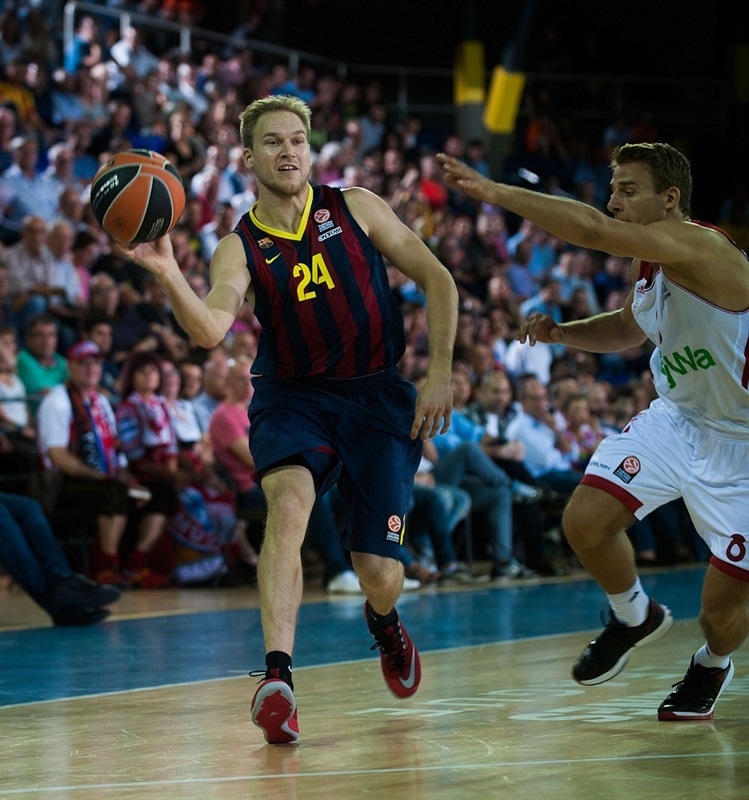 Doellman banked in a close shot and a jumper by Oleson brought Barcelona within 50-52. 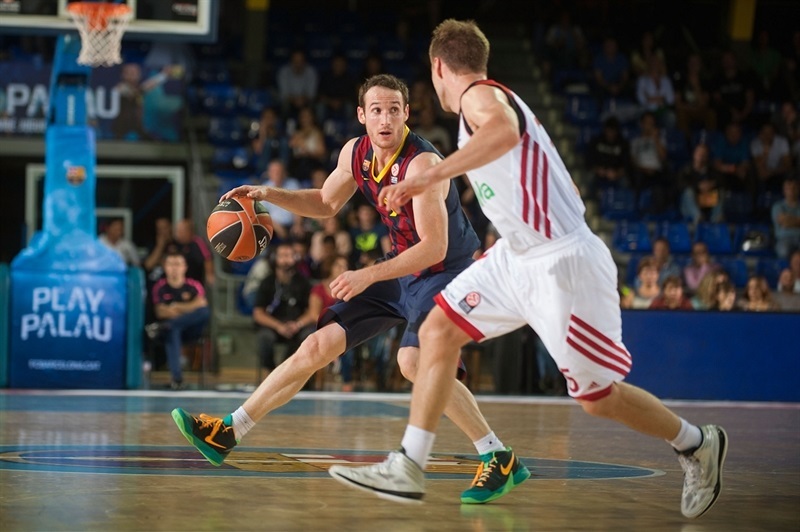 Bryant struck from downtown but Abrines dunked and Huertas found his first points for a 54-55 Barcelona deficit. Bayern managed to stop Barcelona from finding open shots off a timeout. Meanwhile, Micic stepped up with a mid-range jumper and free throws by Djedovic restored a 54-59 Bayern lead. Tomic scored down low and free throws by Navarro made it a one-point game, 58-59. Tomic followed a big basket with free throws to put Barcelona back ahead, 62-59, after 30 minutes. Oleson hit a jumper early in the fourth quarter, as Barcelona kept excelling on defense, forcing Bayern to go scoreless for more than 4 minutes. Meanwhile, Tomic took over with a big alleyoop slam which forced coach Svetislav Pesic to call timeout at 66-59. Nachbar beat the shot clock buzzer with a mid-range jumper to cap a 14-0 Barcelona run which bridged between the final two quarters. Bayern was not done, however, as Savanovic split free throws, Bryant added a layup and Schaffartzik soon forced Barcelona to call timeout at 68-64 with under 6 minutes left. Doellman and Djedovic exchanged jumpers and a three-pointer by Oleson ignited the crowd at 73-66. Djedovic also hit one from beyond the arc and free throws by Benzing brought Bayern within 73-71 with over 2 minutes left. Oleson struck from downtown and did Huertas to seal the outcome, 79-71. Bayern kept trying but Barcelona stayed calm in the final seconds to cruise to a valuable win. "I am very happy with this win. The first game is always difficult. We had defensive mistakes, especially in four three-point shots that came for our tactic errors, something that cannot happen. That allowed them to score more than they should. We also did good things, showing character and being able to react when we were down by five, taking the lead. 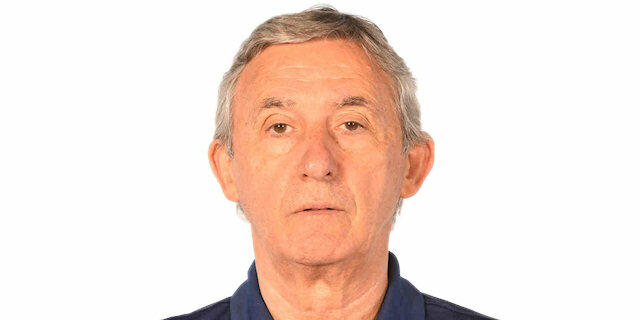 Pesic and I have a good, friendly relationship for many years. 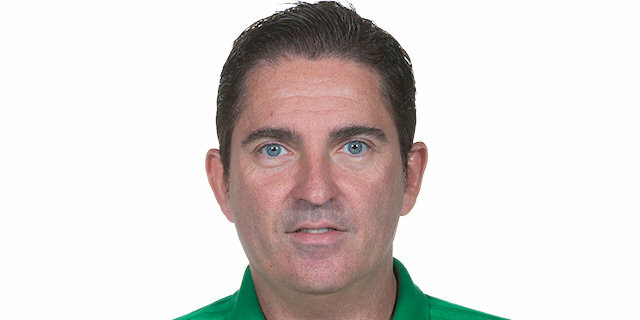 I admire him as a coach and his team's defensive style is similar to ours. They have a well-organized offense and a winning character. In many ways, we have a lot of similarities. I am happy to have played against him. It was a very demanding week, with three games and we were tired at times but at the same time, we did our preparation to be ready at this moment." "I'm not disappointed. This was a game in which we had our chances to win. As always when you play on the road, it is especially important to avoid many turnovers and win in rebounds. We succeeded and that allowed us to compete against a team that has a lot of talent, especially on offense. We played great transition defense. But that cost us at the end of the game, especially since we had so many physical problems this week." 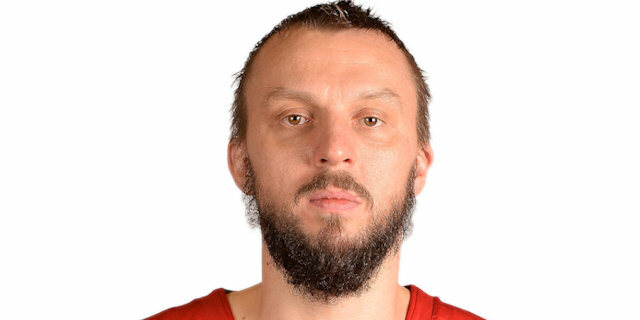 "It was a good game, very tough, as every Euroleague game. We have a tough group and every game is important. We have to keep playing and keep winning at home, that is the most important thing if this group. We have to win at home, it is the only way, and give all we have on the road to se if we can win more games, too." "It was a great game which was decided by details. We controlled the game for the best part of it but that 14-0 run made it more difficult for us. We showed character and returned to the game, keeping our options alive but those three-point shots by Brad Oleson and Marcelinho Huertas sealed it. We proved we can beat anybody and are looking forward to our first home game against Panathinaikos."